Sauteing garlic in olive oil is a humble starting point to so many classic Italian dishes. Adding broccoli & cavatelli transforms these simple ingredients into the ultimate Southern Italian comfort food. This recipe combines crisp-tender broccoli & toothsome cavatelli -it’s quick to make & will leave you wanting more. How is it possible for the simplest foods to offer the maximum amount of flavor? Take, for example, the process of sauteing garlic in good quality olive oil. As you probably know, this is the starting point to so many classic Italian dishes, like pasta aglio e olio, vegetable recipes such as this broccoli rabe recipe or this broccolini recipe, to name but a few. Today, we will sauteing garlic, while also using a couple of other ingredients, to make this sauted broccoli and cavatelli dish. Get ready for some old fashioned Southern Italian comfort food! The first thing we need to do is to bring a large pot of salted water to a rolling boil. Please note that I will be using this Homemade Cavatelli recipe which become al dente in just a couple of minutes. So, if you are using a commercial brand of cavatelli, they may take longer to cook. As a result, please adjust the timing between cooking the pasta and sauteing the broccoli accordingly. While waiting for the water to boil, we can prep the broccoli. Both the stems and the head of this vegetable can be used. Rinse and set aside while we start sauteing the garlic and the anchovies. In a large skillet, heat about 6 tablespoons of olive oil over medium-low heat. Sauté about 6 minced garlic cloves for a 1-2 minutes. When you start smelling the garlic, add about 3-4 anchovies and mash them together with a fork or the back of a spoon into a smooth paste. This should take about 1-2 minutes. Feel free to add red pepper flakes for extra heat. You can use more, or less, or even no anchovies for this broccoli and cavatelli recipe. Go with your personal preferences! But that being said, I find they do add quite a bit of character to this dish. Nutrition Note: Not only are anchovies high in heart healthy omega-3 fatty acids, they also contain the least amount of harmful chemicals (like mercury). It’s now time to add the bite sized pieces of broccoli to the pan and saute for at least 5 minutes until crisp-tender. By this time, the water should be boiling. Time to add the salt and the cavatelli. Transfer about 1 cup of the pasta water to the broccoli to help stream the broccoli. Turn the heat to medium high. Taste your broccoli to make sure it is cooked to your liking… I like it to be tender-crisp. As the cavatelli float to the top, remove with a slotted spoon and add to the pan with broccoli. I will also add another ladle of pasta water, turn the heat to high and mix the whole thing together for a few minutes until the water is almost evaporated. A sprinkle of cheese and a drizzle of olive oil and supper is served. 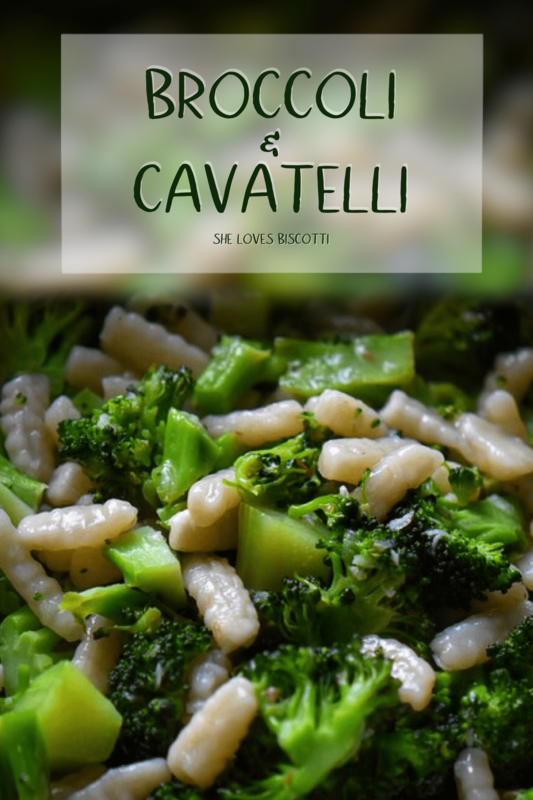 It’s back to my younger years for this broccoli cavatelli recipe. I grew up with a lot of simple dishes with lots of family and friends gathered around the table. I have so many memories of how my mom would just whip up meals at a moment’s notice. The scenario would always be the same… the door bell would ring (at times someone would just pop in unannounced from the back door à la Everybody Loves Raymond) and before the initial greetings were exchanged, the invite to “have a bite” and stay would be heard. And just like that, the frozen cavatelli would come out of the freezer, more often than not, served with a green vegetable. Sauteing garlic in olive oil is a humble starting point to so many classic Italian dishes. Adding broccoli and cavatelli transforms these simple ingredients into the ultimate Southern Italian comfort food. The combination of crisp-tender broccoli & toothsome cavatelli is quick to make & will leave you wanting more. Over high heat, bring a large pot of salted water to a rolling boil. While waiting for the water to boil, trim and cut up the stems and head of the broccoli. Rinse and set aside. In a large skillet, over medium-low heat, heat about 6 tablespoons of olive oil. Sauté about 5-6 minced garlic for a 1-2 minutes. Add the anchovies and mash them together with a fork or the back of a spoon into a smooth paste. If using, add red pepper flakes. Add bite sized broccoli to the pan and saute for a 5-8 of minutes until crisp-tender. Add the pasta to the boiling water and cook until al dente or to desired consistency. Transfer about 1 cup of the pasta water to the broccoli to help stream the broccoli. Increase the heat to medium. Broccoli should be crisp tender. Make sure to taste so that you have the right texture. When the cavatelli float to the top, taste one to make sure they are al dente (they will continue to cook with the broccoli). Remove cavatelli with a slotted spoon and add to the pan with broccoli. If mixture appears dry, add some more pasta water (I will usually add another ladle or so of pasta water; increase the heat and mix the whole thing together for a few minutes until the water is almost evaporated). Taste to make sure everything is cooked right. Top with extra cheese and a drizzle of olive oil, if using. One year when I taught Kindergarten, I had a student who went home for lunch and everyday and I mean everyday, he’d literally crow out the news that he was having pasta broccoli for lunch. If his meal was anything like this very tempting recipe, no wonder he was always crowing out this wonderful news… btw, he was eating at nona’s house. This dish is truly a bowl of comfort food… Thanks for your kind words. My mother-in-law used to make this but if I remember correctly she had some form of bacon or pancetta in hers. I know I would enjoy your version with the anchovies as it would be a much lighter dish. Pasta with broccoli is certainly one of my favourites and with cavatelli.. heaven! Classic southern Italian flavors and comfort food at its finest! Another recipe typifying the simplicity of true Italian food. I must hope over to your site! Thanks so much for stopping by… happy Friday!